Two years ago, Lingraphica launched our free news and information service, TalkPath News. More than 2,000 stories later, we’ve learned that people with aphasia have a passion for news and information! One of the biggest issues many individuals with aphasia face is frustration while reading, listening to, or watching the news. Print publications might be too challenging to comprehend, while broadcast news anchors often talk too quickly for individuals with communication challenges to follow along. These issues mean that people may not know what's going on in the world – a basic and fundamental component of daily life. With TalkPath News, articles are slowly read aloud and highlighted to help those with speech or language disorders follow along. New articles are added every weekday, and at the end of every article, a series of questions provides activities for memory recall, reading comprehension, and vocabulary. Over the past two years, readers from 135 different countries have viewed TalkPath News pages over half a million times. Entertainment and National News stories are among the most popular; other categories include World News, Health and Lifestyle, Science and Technology, Education, Business, and History. There is even a TalkPath News Facebook group, where members engage in spirited online discussions about TalkPath News stories and articles. Joe, a stroke survivor and person with aphasia, says: "I use TalkPath News, and I like that it talks to me. I like to read the Entertainment, Science & Technology, and National News sections." Donna, a caregiver, says: "We use TalkPath News, and Bob really likes how it speaks the highlighted words. I like that it's a simplified version of the news...that it's easier to understand. When he's finished with a story, Bob will do the reading comprehension part. It works well for us." 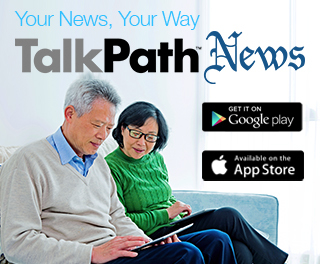 If you are new to TalkPath News, you can sign up for it today! TalkPath News is free to use for individuals and clinicians. Users need to create a free account to access the headlines. To download the app, click the buttons below or visit www.talkpathnews.com.